As the leaves change colour and the temperature begins to drop, we find ourselves applying for continuing education programs, searching for opportunities to wear plaid fashions, and purchasing new stationery supplies. Autumn remains linked to a time of new beginnings; the childhood excitement for a new school year overrides the sophisticated appreciation of summer pleasures. Leisure Projects’, Back-to-School Special embraces these autumnal enthusiasms with an invitational exhibition featuring blue ink on white vinyl. 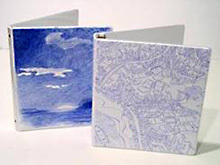 Six artists were invited to produce artworks using ballpoint pens on crisp white vinyl binders. Like a game of three-legged basketball, Leisure Projects introduces contrary game rules to level the playing field, relax artistic inhibitions and encourage new works by artists from various disciplines. With an emphasis on spontaneous drawing (doodling) and the familiarity of the proposed art supplies, we hope to inspire stunning graphic works and new directions in sketch-art production. All artists were provided with drawing materials courtesy of BiC, France.